Congrats, bro. Somewhere between grinding to Kesha and Pitbull and spilling no less than four Fireball shots on your sweater, you met a girl at that holiday party. And if memory serves, she was pretty cute. Unless that’s the Fireball talking – which is a distinct possibility. But you got her number anyway, good for you. Hit her up before the actual holiday. Chances are, one or both of you will be traveling for at least a few days, more if you have vacation time. This means if you don’t send that “Hey, it’s so-and-so from the other night, wanna grab a drink this week?” text soon, you’ll miss out on a crucial window to see if she really is as cool as you remember. Digit exchanges come with a shelf life, after all. And even if you’re slammed with work and tying up loose ends before the end of the year (as many of us are), you can always drop a “Really enjoyed meeting you the other night. Things are kinda chaotic right now but would love to grab a drink after New Years if you’re down?” message. It’ll keep you in the game, and show her that you haven’t lost interest. Confirm basic information. Like, for instance, her name. “Karen” and “Karly” aren’t interchangeable, no matter how many eggnogs you threw back. Also, remind her who you were (“Hey it’s Ryan, the charming, handsome guy in the red pants…” *Also, don’t wear red pants). Dudes aren’t the only ones who work multiple leads at at time, sorry. And finally, approach it with a clean slate. There’s something about fancy clothing and flowing liquor that makes people do crazy things. So if she – or you – did anything embarrassing or said something questionable, disregard it. We promise not to hold spilling a glass of mulled wine on our favorite skirt against you, if you cut us some slack for ignoring you while tending to our too-drunk friend. 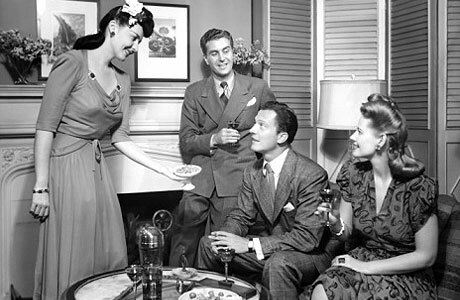 This entry was posted in ETIQUETTE WINGMAN and tagged 3 Rules Of Post-Holiday Party Courtship, dating advice for men, Etiquette Wingman, flirting do's and don'ts, holiday party hookups, how to get a date for New Years, Miss Wingman, relationship advice for men, wingwoman by renata. Bookmark the permalink.